Bonne Maman is known for Jams, and this christmas they have something special in stall for us. The Bonne Maman’s advent calendar is the perfect pre-christmas gift for not only the kids, but adults as well. This calendar offers a unique and different christmas countdown experience through the use of preserves rather than chocolate. 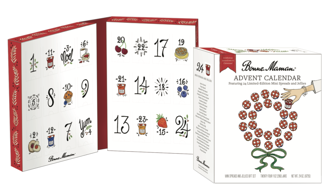 The Bonne Maman’s limited edition advent calendar (SRP $27.99) will be available on Amazon.com and in select stores beginning October 1st. Perfect for holiday gifting for the favorite foodie in your life, the Bonne Maman Advent Calendar includes 24 different, delicious 1 oz jars including fan favorite preserves as well as exclusive, new offerings.